Quilting Adventures: That's just how it's been as of late....! That's just how it's been as of late....! It hasn't been a very good week for me. I discovered these amazing sandwiches from a coffee shop down the street from Fibre called Lakeside Coffee shop. Firstly, do not and I repeat DO NOT ever order a toasted bagel with their veggie cream cheese, you're sure to get addicted! Gosh is that ever good! That's been my breakfast! For lunch it's been a Caprese, fresh mozzarella, sun-dried tomato and pesto grilled sandwich! Another one to stay away! Sigh! Add a latte with that and their amazing crumb cake for dessert and you have my diet for the past few days! Thank goodness it's my day off today! ;o) Time for me to get back on track. Yep, I do live on a hill so it will be challenging going to work and coming back from work. I've been wanting a new bike for a while and I thought yesterday was the perfect day to buy one! They sure don't make them like they used to when I was a kid. I've got shock absorbers on this baby! Oh and about a gazillion gears to make going up those hills easier. I did take a spin on it yesterday to get used to those brakes. Yea, another improvement from when I was a kid. They're surely not ABS brakes! Better not brake quickly or I'll find myself over the handle bar, face first on the pavement. They work alright! Good thing I have a bike helmet! So that's been my week on the new South Beach diet! In all fairness, I did well until Friday, the day the shop opened. But, today is a new day! Oh yes....a new bike. Won't you have fun while burning those calories? I should get one too as I know that the exercise would be wonderful for all of us. Caprese??? I love the combination of flavors. I could do that anytime. Great bike! I was just looking at mine the other day. Before I can take her for a spin, I need air in the tires. The inside of your shop looks wonderful! Best wishes. :) soon you will be like a skeleton on a bike :) no, just joking. The bike looks great and I hope you can use it often. Now that is very clever, Carole! I should have thought of that when I owned several businesses! I got so busy that I ate out all the time and put on a lot of weight - took me even longer to finally take it back off! I, too, only work 5 miles from home. For the past 2 years, I've ridden my bike in the warmer months. 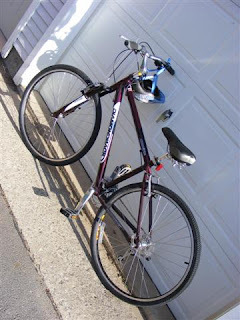 I have what is called a commuter bike: 21 gears, bigger tires. Love it. So many new adventures for you... enjoy each step of the journey, and especially the downhill portions. That looks like so much fun. I'd love to ride a bike to work -- my route would be a bit dangerous though. Someday, I hope they'll have bike paths all over. Be careful out there! What a great idea to ride your bike to work and burn calories at the same time. So many new things in your life. Working and biking. We rode 10 miles yesterday on our bikes, I just loved it. Yours looks like a very steep hill, yikes! sore thighs tomarrow! It's been way toooooo lonnnnng.....!